Last week I went Kiwi listening up the Avalanche creek track. 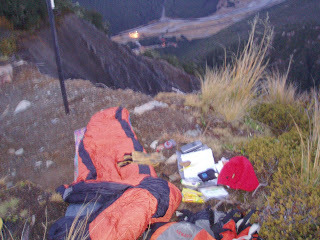 Here is a picture of my position complete with sleeping bag and assorted kit such as a GPS, compass, eperb,pen and paper and warm clothes. I was listening into the Rough creek catchment. At about 8pm I packed up and was heading down the track when I came face to beak with a Great Spotted Kiwi, only a few hundred metres away from where I'd been listening all night! It was an amazing experience seeing one in the wild. It was an adult bird and seemed in very good health. After we had our moment it slowly meandered into the bush.